Hundreds of mourners paid their final respects to reality television star Jade Goody on Saturday, most of them watching her funeral play out — like much of her life — through the lens of a camera. Goody died of cancer March 22 at age 27, shortly after marrying her fiance Jack Tweed in a media extravaganza. Her funeral, too, was a media event, with a flower-laden vintage Rolls Royce hearse tracked by a crowd of photographers and a television helicopter. A mass of fans and journalists gathered at St. John the Baptist Church in Buckhurst Hill, just east of London, where large television screens were installed to relay the service to the public. Her publicist said Goody wouldn't have wanted it any other way. "She will have a big smile on her face when she sees what is going on today," Clifford told reporters before the burial. Goody first caught viewers' attention in 2002 when she appeared in the "Big Brother" television reality show where contestants are locked inside a house and filmed for weeks at a time. Goody's crude language and eye-popping gaffes — she once asked fellow contestants whether Rio de Janeiro was a person — both repelled and fascinated audiences. Goody was vilified in the press as uneducated and was criticized for allegedly racist behavior. But her reputation was rehabilitated when she made the decision to film her battle with cervical cancer to raise money for the education of her two young sons. Politicians, clergymen and doctors praised her for drawing attention to the importance of screening for the disease. Those gathered to attend the funeral Saturday said Goody — known simply as Jade — was a British everywoman made good. "She was just a real woman who always put her kids first to the end," said mother-of-seven Kirsty Brooks, 34, who traveled more than seven hours with her three sisters to witness the funeral. Some floral tributes to the star made playful references to her malapropisms, while others praised her as a legend, a wife and a daughter. 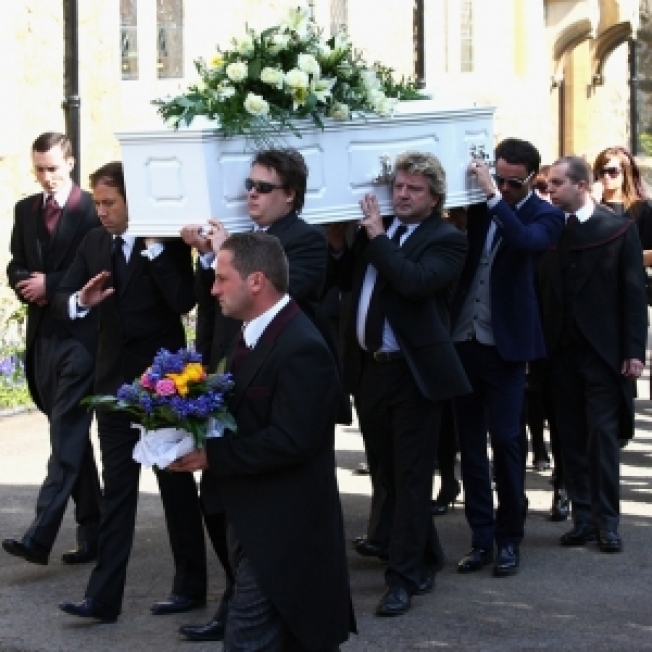 Mourners applauded as Goody's coffin was carried from the church. Clifford said Goody would have been pleased with the attention. "In life she loved being loved and it is pretty clear that this is the overwhelming feeling today," Clifford said.